Spending time at Fort Foster during the first minutes of daylight was a great decision this weekend. I spent equal parts of the morning running around to try and get great shots & strolling around just enjoying the view. 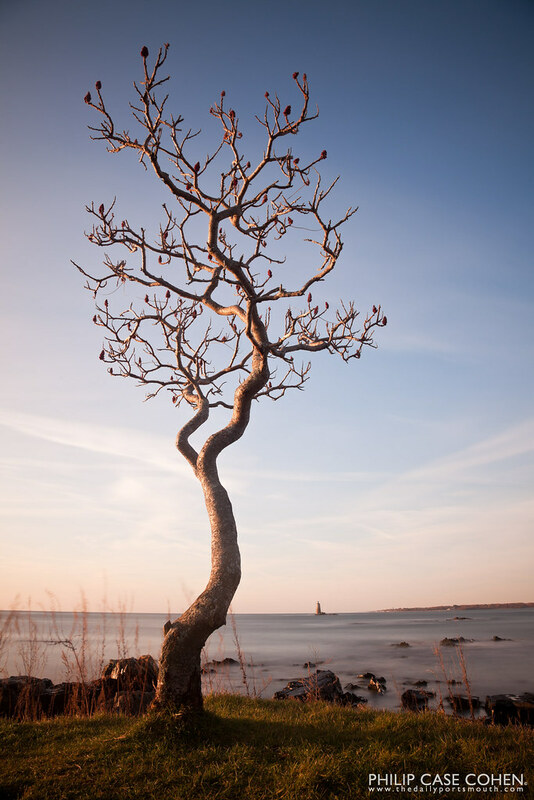 There was something about this lone tree along the coast that struck me as majestic and very peaceful. I grabbed the 10-stop neutral density filter and made a 65-second exposure, getting some dreamy light on the tree’s bare limbs and some soft water texture with the movement of the tide. Whaleback Lighthouse is a nice treat in the background. On another note, I would like to acknowledge all of the wonderful people who bring a positive vibe to the photography community, and recognize those who provide their feedback (whether good or bad – as long as it’s constructive). If you know me or have ever taken the time to chat (which I’m ALWAYS up for doing), you’ll know that I definitely don’t know everything there is to know about photography (and don’t profess to) – but I am always happy to share what I do with those who want to learn, and always encourage others, while seeking growth for myself. This weekend’s sunrise shoot with some very talented gentlemen (who seriously humble me) was a great example of that….I came back with a few shots that I’m happy with, but have seen some iconic and epic landscapes that made my jaw drop. At the end of the day, I think it’s important to pay it forward, always be appreciative, and always strive for better. A sincere thanks to all those who deserve it – I’m glad you stopped by to read today and hope you enjoy the tree. Be-yoo-ti-ful! After all this time with The Daily Portsmouth I’m beyond being gobsmacked, but sometimes I come up wordless.